One of our priorities for this year was to improve our remote access offering to staff to enable more flexible working whilst outside of college. Office 365 helps greatly and has already improved functionality in many ways but there’s still some legacy applications and classic file shares that need to be provided remotely too. If at all possible we prefer the files not to leave the network so some form of virtual desktop looked the way to go. After discounting VMware and Citrix offerings on cost grounds the improvements to Microsoft’s RDS offering in Server 2016 seemed to come at a perfect time. Even more so now we’ve implemented Azure AD Application Proxy (more on that shortly!) We’ve also recently decommissioned some services that freed up a bit of physical hardware resource to “play” with so away we went! If you want to restrict access to your Remote Access Gateway and add pre-authentication for remote access, you can roll it out through Web Application Proxy. This is a really good way to make sure you have rich pre-authentication for RDG including MFA. Publishing without pre-authentication is also an option and provides a single point of entry into your systems. Installation will be different depending on whether your RD Web Access (/rdweb) and RD Gateway (rpc) roles are on the same server or on different servers. If the RD Web Access and RD Gateway roles are hosted on the same RDG server, you can simply publish the root FQDN in Web Application Proxy such as, https://connect.abc.com/. You can also publish the two virtual directories individually e.g. https://connect.abc.com/rdweb/ and https://connect.abc.com/rpc/. Below is a step by step to getting a basic RDS gateway configured. There are additional steps and considerations that you may need to consider for your environment. In this example I am using port forwarding into my test lab, but you will want to consider where this server should be placed in your network and ensure proper firewalls are configured. What is a Remote Desktop Gateway? What groups of users can utilize the RD Gateway. 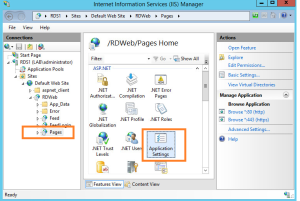 To use the “connect to a Remote Computer” feature in RDS 2012 you would need to add the RD gateway address to the settings on the web access server. 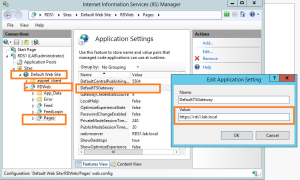 To do this you would need to open up IIS in the RDweb Server. Enter the external address (FQDN) of the RD Gateway in the Value Field. Enter the external RD Gateway FQDN. You will now be able to remote to devices using the Web interface. A Remote Desktop Gateway Server enables users to connect to remote computers on a corporate network from any external computer. The RD Gateway uses the Remote Desktop Protocol & the HTTPS Protocol to create a secure encrypted connection. A 2012 RD Gateway server uses port 443 (HTTPS), which provides a secure connection using a Secure Sockets Layer (SSL) tunnel. Enables Remote Desktop Connections to a corporate network without having to set up a virtual private network (VPN). Enables connections to remote computers across firewalls. Allows you to share a network connection with other programs running on your computer. This enables you to use your ISP connection instead of your corporate network to send and receive data over a remote connection. Setting up a RDS Farm is not that hard but anyway I created a step by step guide to build a Windows Server 2016 Remote Desktop Services deployment. there is a new feature in the Windows Server 2016 RDS : Full OpenGL support with RDS for VDI scenarios. And Yes you can use the Quickstart but I’m not using this in this demo setup. I tried to do a complete setup,but doing this I noticed that I’m constantly expanding this demo with new options so. I’ll keep this pure to the setup and some PowerShell basics. Trend Micro IWSVA is a web proxy that has lots of security feature such as antivirus, antimalware, but it is also a web filter, similar to WebSense Web Filter where URL categories can be blocked to protect the end users, and of course to avoid browsing non-productive web sites inside the company. However, if you download the VMware image, the disk image is quite small and could get full easily if your environment has lots of user and HTTP traffic to process, and of course, logs as well. Below is a procedure to increase the disk size in a VMware vSphere environment. Best practices for DNS settings on DC and domain members. The following information explains the Best practices for DNS client settings on Domain Controller and Domain Member. In single DC/DNS in a domain environment, DC / DNS server points to its private IP address (not to loopback 127.x.x.) as preferred DNS server in TCP/IP property. If multiple DCs that’s the DNS servers are in a domain environment, recommendation to have all DCs point to ANOTHER/REMOTE DC’s IP address as preferred DNS and then point to it’s private IP address as an alternate DNS. Each DC has just one IP address and one network adapter is enabled (disable unused NICs).